Many of us live in areas where winter is long and harsh, and for some this means that their barbecue sits idle for up to five months. 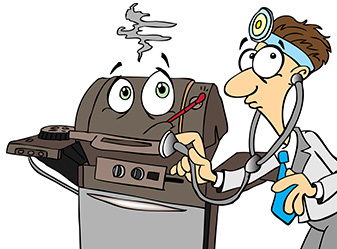 While we are just as excited as you are about the prospect of firing up the grill, it's a good idea to run some basic tests and conduct a spring cleaning before putting meat to fire. Here are five helpful tips to get your gas grill ready for spring. Check for any possible gas leaks which can be caused by loose connections or a damaged gas hose. To do this, we recommend that you perform a leak test using a 50/50 mixture of dish soap and water. Step-by-step instructions can be found here. Remove and inspect the burners to verify that they were not infiltrated by spiders or other insects. Spiders in particular are apt to build nests inside burner venturi tubes, which impede the flow of gas and can cause uneven flames and in some cases flash back fires. Regardless of what you find on inspection, it is a good idea to run a venturi brush into the burner to give the inside a good cleaning. If you don't have a venturi brush you can get one here. Batteries discharge more quickly in cold temperatures, so test your electronic igniter if you have one to ensure that it is working. If it is not working, chances are the battery is drained. Pop in a new AA battery and you should be good to go. If that doesn't solve the problem, check to make sure that the all of the electrodes are secure at the back of the igniter button and the ignition module. Give your grill a thorough cleaning, paying particular attention to the cooking grates. We recommend washing the grates with warm soapy water, drying them, and then applying a coating of vegetable oil to protect them. That last step is particularly important for cast iron grates, which will pit and rust it not properly seasoned on a regular basis. Is your propane tank full? Unless you have a tank gauge, you probably don't know. If you are unsure, pop the tank on to your bathroom scale. A full 20-pound tank will weigh in at about 37 or 38 lbs. An empty tank will be closer to 18 lbs.